Absence of hypertension maximises skin perfusion which is vital for matrix remodeling. Women who have undergone previous radiotherapy treatment and heavy smokers should be excluded from this procedure if possible. Native® is freeze-dried allowing for simple storage at room temperature and must be rehydrated before implantation by placing it in a sterile bowl for a minimum of 5 minutes at room temperature, fully covering it with sterile saline solution, Ringer’s solution or Ringer’s lactate solution. The Native® matrix can be cut to the desired shape before or after rehydration. Keep Native® in the sterile solution until ready to use. The acellular matrix can remain in the sterile solution for a maximum of four hours. 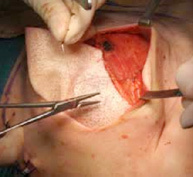 Following standard mastectomy techniques and dissection of the pectoralis major muscle to create the implant pocket Native® is sutured to the chest wall at the inframammary fold line using interrupted sutures. 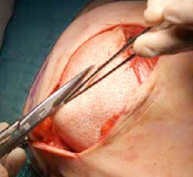 After inserting the breast implant under the pectoralis major muscle the superior edge of the matrix is sutured to the inferior edge of the dissected pectoralis major. 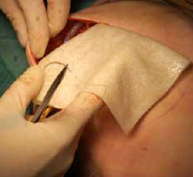 This allows control and stabilization of the lower pole of the breast implant.